In order to produce a compacted strand, a conventional strand made out of round wires is drawn through a compacting tool. During this procedure, the wires are partially deformed, the strand diameter is reduced and the surface is made smooth. The contact conditions between the individual wires and the strand-to-strand contacts improve. Ropes made out of compacted strands have a higher breaking load, a greater flexibility and better rope-to-sheave contact conditions than comparable ropes made out of conventional strands. Because of the greater exterior surface area created as well as the reduced valleys between wires, they are more resistant to abrasion and corrosion. 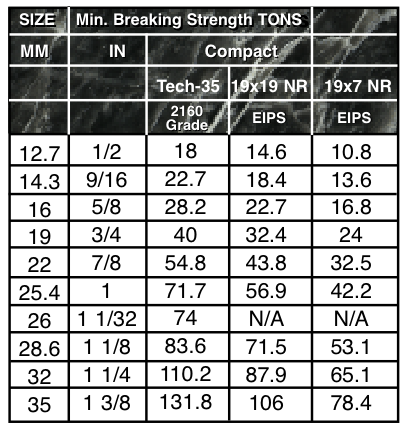 Compact 35 x 7 such as Tech-35 are the strongest of all rotation resistant ropes. It is important to note that the breaking strengths from this chart are with both ends terminated. Although it is commonly done, it is recommended by all wire rope manufactures that 19×7 and 19×19 constructions are not to be used with swivels. What occurs in a swivel application with these particular constructions, is that as you increase load, the core will tighten and thereby loosen the outer strands. This causes a drastic reduction of breaking strength and cork screwing. The loosening of the outer strands increases the diameter of the wire rope not allowing it to turn properly on the sheave, many times causing stacking on the drum and eventually destroying the rope. “The use of an open swivel (allowed to rotate freely) continuously during operation of the rope is a practice that must be carefully considered. Open swivels are not recommended for use with 8×19, 19×7, and 19×19 rope classifications. 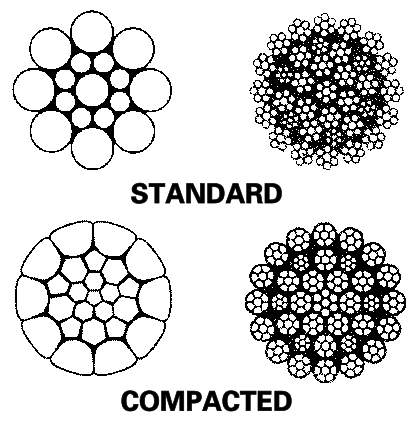 For other multi-strand constructions, consult the rope manufacturer for recommendations regarding the use of swivels”. Note: Tech-35 not only can be used with a swivel, but it is recommended. 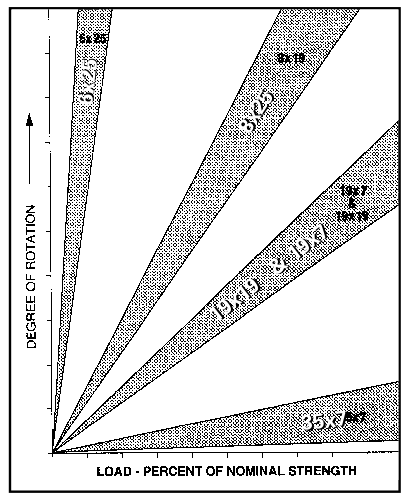 Tech-35 provides the greatest resistance to rotation of all the rotation resistant ropes available as shown in the chart located to the left.